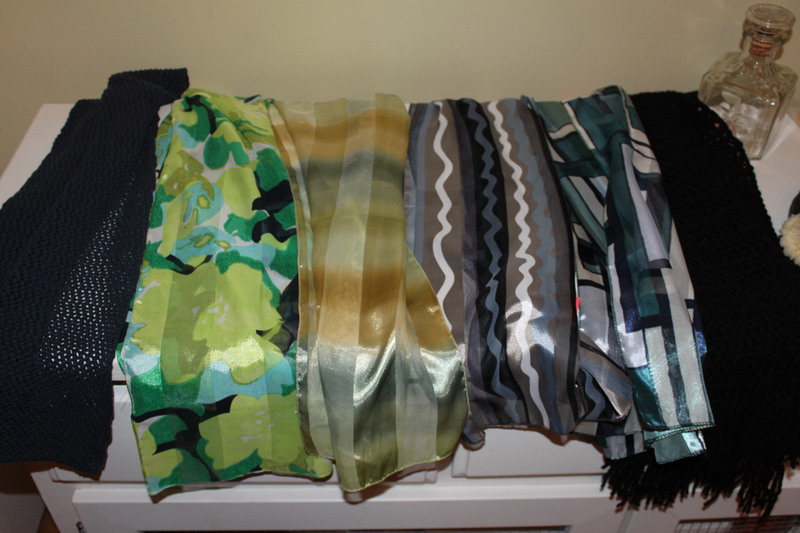 You may remember that I picked-up several beautiful scarves while out “thrifting” one day. I got them for a buck-fifty each and felt like I scored big. I washed them and began to play with them, experimenting with different knots and styles. (If you are interested in creative ways to wear a scarf, check-out my previous post that featured a video demonstrating 25 ways to tie a scarf.) It didn’t take me long to realize that all of the scarves were similar in length and seemed to be quite a bit shorter than others I owned. I found them a bit difficult to work with because of their odd length. I decided that a clip or pin of some kind might help to make them “work” for me. Last week, I shared the t-shirt flower tie that works like a charm! You basically tie the flower around the scarf and then play with it until you achieve a style you like. Still, I couldn’t help but think that I would love to have a piece of jewellery that would serve the same purpose. I really wasn’t sure where you would purchase “scarf jewellery”, so I did what all DIYers do…searched the web. I can’t say I really found what I was looking for, but Pinterest is packed with all kinds of ideas for re-purposing old cutlery. I figured I could modify some of the ideas that others shared and make it work for a scarf…why not? On the weekend, I went to a local antique store and purchased a handful of old silverware for $5. Although I really didn’t know what I was doing, I proceeded to bend and twist one of the old forks until I came up with what I deemed to be a funky little piece. Some of the on-line tutorials talk about heating up the silver with a torch, but others just used basic tools to get the look they wanted. I didn’t really want to” play with fire”, so thought that I would stick to elbow grease, pliers and a hammer for my first project. I think it probably helps if you know what kind of material the utensils are made of, as some work better with a heat source while others don’t require it. I don’t know what these forks and spoons are made of and really wasn’t interested in investing the time to figure it out. I saw some cool pieces on-line and just wanted to see what I could come up with. If I end up creating more pieces, I will make sure I am using the appropriate techniques to create a more “polished” finished product, but for my first attempt trial and error seemed like the best course of action. Overall, I am pleased with what I came up with and will wear it. It is a simple loop, so you need to actually knot the scarf into it. I will definitely try more pieces like this. I love the idea of “scarf” jewellery! Next time, I will probably try to “test” my piece to determine what it is made of and then use a heat source, if necessary. I am a little nervous about that and will probably work on my basement floor, so I don’t burn the house down. Anyways, I will keep you posted and let you know if I come up with any cool designs to share. For this one, I added in one of the baked marbles I made earlier this week. I basically glued the base of it to the fork and then wrapped the bent prongs around it. Hopefully it will hold. Posted on March 6, 2014 by Cindy Roy •	This entry was posted in DIY and Upcycling and tagged antique cutlery, fork jewellery, scarf jewellery, upcycled fork. Bookmark the permalink. If you want to clean your old silverware in seconds, line the kitchen sink with tinfoil and put in 3 Tbsp Calgonite water softener then pour on a kettle of boiling water. Add the silverware (NOT the knives or the handles will loosen) and fill up the sink with hot water. In seconds they will be cleaned and shiny. Wash in soapy water, rinse and dry. Perfect. I have a mountain of silver flatware and other stuff, and I have been using this method for years. What an awesome tip! I will have to try that. Thanks Auntie! !